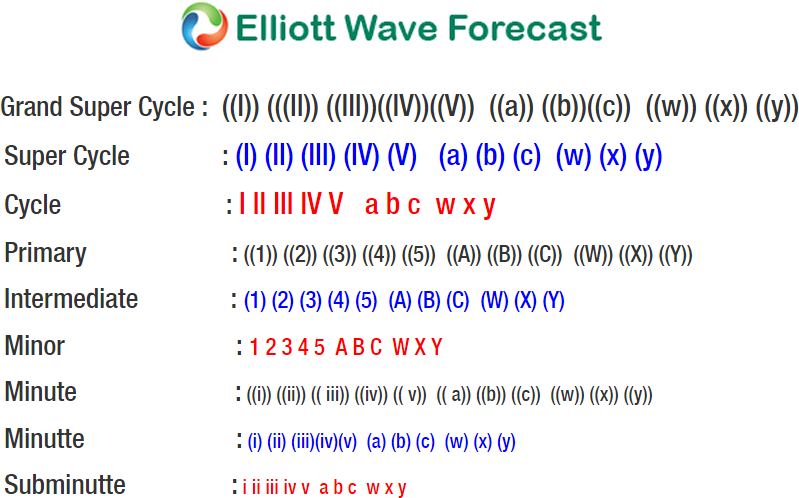 USD/CAD Elliott Wave short-term view suggests that the bounce to 1.2942 high ended Intermediate degree wave (2). Then the decline from there is unfolding in an impulse sequence with an internal sub-division of each leg lower is showing 5 waves structure thus favored it to be an impulse. Below from 1.2942 high, Intermediate wave (3) remains in progress in 5 waves structure looking for 1 more push lower before a bounce in Intermediate wave (4) takes place. Now let’s take a quick look at the short-term price action in the pair from 1.2942 high. The decline from there can be seen in 5 waves impulse sequence, where Minor wave 1 of (3) ended in 5 waves at 1.2744. Minor wave 2 of (3) ended 1.2818, Minor wave 3 of (3) ended in another 5 waves at 1.2543 low. And above from there Minor wave 4 of (3) bounce ended in 3 swings as a Flat structure at 1.2622 high. Below from there, the pair is expected to see another marginal push lower towards the inverse 1.236-1.618% ext area of Minor wave 4 at 1.2524-1.2493 area approximately to end the Minor wave 5 of (3) lower. However, in case of further downside extension pair can extend in Minor wave 5 of (3) towards wave 5=1 target area as well at 1.2418-1.2373 area before a bounce in intermediate wave (4) takes place against 1.2942 high. Which should then expected to fail in 3, 7 or 11 swings against 1.2942 high for further downside extension, so don’t like buying the pair into proposed bounces.